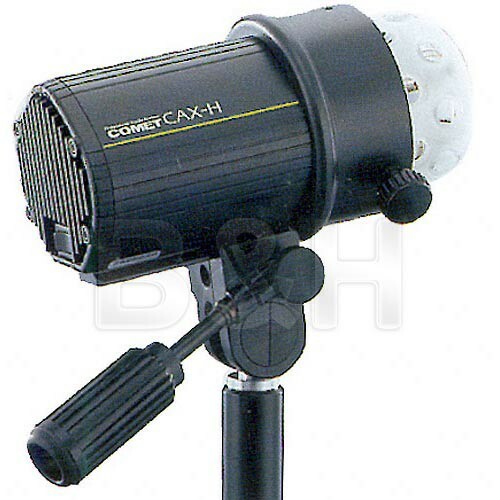 The Comet CAX32H is a very compact 3200 Watt/second focusing flash head. The lamp base dials into different positions, to alter the light output of the head. A power supply for this flash head is required. Because of its detachable power cord, this head is extremely easy to place, and pack away. All Comet lampheads feature an integrated tilt mechanism for continuous tilting for stand or suspension mounting. Also featured is an integrated umbrella holder with a 3/8" hole for rapid placement of any umbrella shaft size. All Comet lampheads feature a user replaceable flashtube and reflector assembly. No tools are required to replace this "plug & play" assembly. By simply rotating a dial on the head, the flashtube and diffuser assembly telescopes forward and backward to allow a change in light coverage and concentration of the hot spot, similar to focusing a mag-lite flashlight. A full array of 9 reflectors and various light-controlling accessories are available. 250W quartz halogen provides a bright light to focus and compose by. Detachable 14' power cable allows placement far from the power pack. Box Dimensions (LxWxH) 18.0 x 9.1 x 8.8"